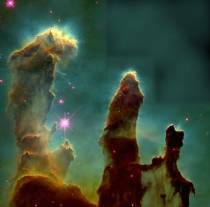 The Galactic Question Center: Which image? If we type my last name, Pickover, into the Google image search, we find an amazing array of images -- from computer graphics, to creatures, to startling people. Which image do you like best? Fractals by Jas Leys. This one's in the Invaders From Mars gallery. Clifford A Pickover's Home Page Lo. www.umich edu by Todd McKinney. I love it. I saw this & the other 18 pages didn't even matter. Rather than choose from yours, I decided to choose from mine. I typed my last name in & about all I got was some dippy little town in Wisconsin. That's ok, not much else in my life is exciting either.